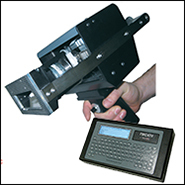 These systems are designed primarily for handheld applications. They also find use in online or benchtop applications due to their compact size. The TMP4750 is the latest addition to the PINSTAMP® line of dependable dot peen marking systems. Available in both handheld and fixed mount models, the TMP4750 features a heavy duty stepper motor with rack and pinion drive for superior marking performance. The NOMAD 4000 is a fully portable, rechargeable, battery powered hand-held marking system. Mark up to .011 inches (0.3mm) deep in mild steel with the extremely robust yet highly portable NOMAD 4000 hand-held marking system. With an electromechanical pin that eliminates the need for any air supply, the NOMAD 4000 is the perfect choice for applications requiring both portability and durability. 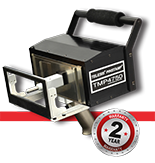 The unique PINSTAMP® TMM4200 Multiple Pin Marking Head can be equipped with up to four marking pins for very high speed marking, yet weighs only 4.5 pounds (2.0kg). Its light weight, compact ergonomic design, plus optional pistol-grip handle make the TMM4200 the ultimate hand-held permanent marker. The PINSTAMP® TMP4210/470/600 is an extremely lightweight, hand-held, single pin marker satisfying a wide range of portable marking applications. Its robust rack-and-pinion design and compact envelope also make it the right choice for many high production, on-line applications. The innovative PINSTAMP® dual-pin TMM4215/470 provides a 4" x 0.5" (100mm x 13mm) marking window, twice as large as that of the TMM4200. This lightweight, compact marker is available in both fixtured and hand-held configurations.